He could not match the winner, Master Minded, when the favourite turned on the power, but going down by seven lengths was no disgrace. Well Chief won the 2004 Irish Independent Arkle Trophy and was runner-up in the following year’s Queen Mother Champion Chase, but his constitution has not matched his ability. Initially trained by Martin Pipe, and more recently by his son, David, Well Chief’s latest tendon problem meant he had not been seen in public since April 2007, but his owner, David Johnson, and the team at Pond House never lost faith. David Pipe said: “It’s been a great team effort. Jonothan Lower rides him every day and his groom, Eileen Defew, has put in endless hours. So many people have played a part, not least the swimming pool, which has been his home on occasions. The 2006 Seasons Holidays Queen Mother Champion Chase winner Newmill, a 100/1 chance today, put in a great effort to take fourth. 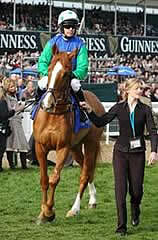 "He’s 11 now and I’m delighted," said trainer John Murphy. "He was in absolutely brilliant form beforehand so I was hopeful he’d run well. He’s always been plagued by a lung problem and been difficult to train but this time of year he comes good. On his good days he is very good and possibly he’ll go to Aintree now over two and a half miles and then hope for faster ground. He’ll then go to Punchestown and get his beloved good ground, that’s what he really needs."